Poverty is a universal problem that affects every nation on earth—both rich and poor. The world’s wealthiest nations have the means to substantially reduce poverty rates in their countries by providing cash assistance and in-kind benefits to those in need. This graph shows how the generosity of a country’s expenditures on public assistance is related to the child poverty rate after accounting for those expenditures. Specifically, we plot social expenditures minus pensions as a share of gross domestic product (GDP) for the United States and select Organisation for Economic Co-operation and Development (OECD) countries against each country’s post-tax, post-transfer child poverty rate in 2014. We subtract pensions from social expenditures because they are a relatively large social expenditure in some countries, but do not directly benefit most children. While social expenditures alone don’t determine a country’s poverty rate—unemployment, wages, inequality, and the overall strength and stability of the economy are the biggest determinants—there is a clear relationship. 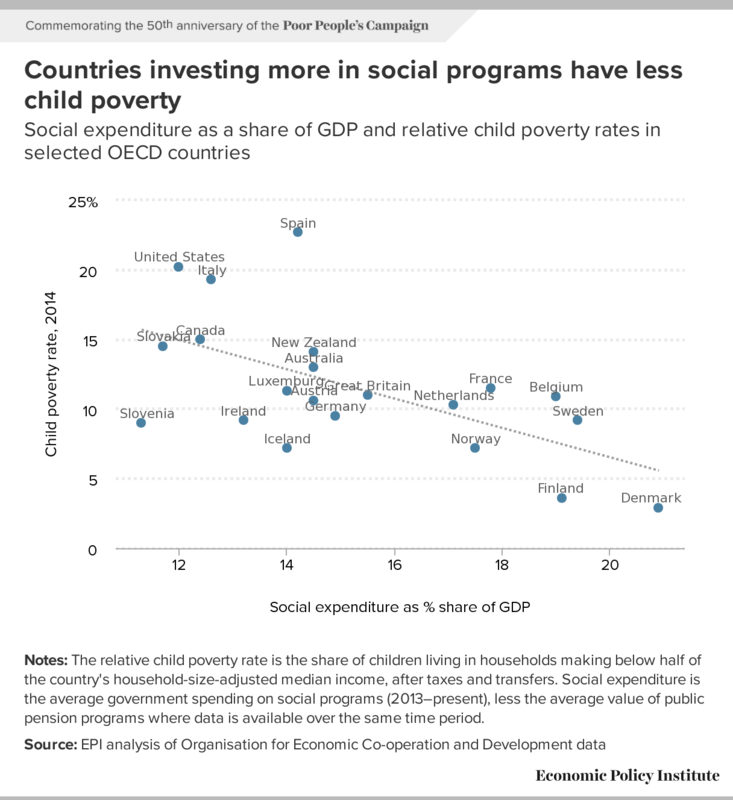 The data show that on average, the relative child poverty rate tends to be lower in countries that choose to invest more of their national income in programs that alleviate poverty and material hardship. For example, Denmark and Finland are among the nations with the most generous social expenditures (each spending close to one-fifth of their GDP) and the lowest post-tax post-transfer, child poverty rates (both below 4 percent). The United States, in contrast, is much less likely than peer countries to step in where markets and labor policy fail in order to lift their most disadvantaged citizens out of poverty. In 2014, the United States had the second highest post-tax, post-transfer child poverty rate (20.2 percent) among the developed OECD countries included in the graph and spent the third lowest share of GDP on social programs (12.0 percent), after Slovenia (11.3 percent) and Slovakia (11.7 percent). Notes: The relative child poverty rate is the share of children living in households making below half of the country's household-size-adjusted median income, after taxes and transfers. Social expenditure is the average government spending on social programs (2013–present), less the average value of public pension programs where data is available over the same time period. Notes: The relative child poverty rate is the share of children living in households with income below half of household-size-adjusted median income for the country. Two countries with the same child poverty rates may differ in terms of the relative income-level of the poor. Poverty rates are based on income after taxes and transfers. Social expenditure is the average government spending on social programs (2013–present), such as Social Security and Medicare in the United States, less the average value of public pension programs where data is available over the same time period. The equation for the trend line is y = -1.0536x + 0.2758 and the R² = 0.3575. The United States has the economic means to do much more to reduce child poverty. The 1968 Poor People’s Campaign was about calling attention to the injustice of poverty and the fact that U.S. policymakers had not done more to invest in real and lasting solutions. 50 years later, this sad reality remains.